IAM Local 1943 President and Directing Business Representative Neil Douglas testifies at a U.S. International Trade Commission hearing on overcapacity in the steel industry and the effect foreign steel dumping has on American steel industry workers. Unfair trade practices that allow cheap foreign steel to flood U.S. markets are having a devastating effect on U.S. workers in the steel industry, IAM Local 1943 President and Directing Business Representative Neil Douglas told officials at an International Trade Commission hearing in Washington, DC. The global excess capacity of steel threatens businesses and workers alike, and poses a national defense threat if the U.S. domestic steel market fails, Douglas said. Steel is used in nearly every form of infrastructure and military machinery. Testifying alongside labor leaders from steel mills across the country, Douglas followed steel industry representatives speaking on the impact overcapacity is having on their market. Uncertain economic conditions due to foreign steel dumping led to 4,000 layoffs in the U.S. steel industry during 2015 alone. 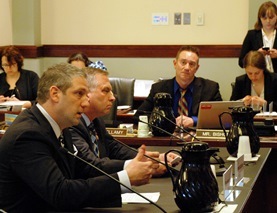 U.S. Rep. Tim Ryan (D-OH) testifies at the U.S. International Trade Commission. “Our workers can’t be on the agenda, they must be the agenda,” said Ryan. 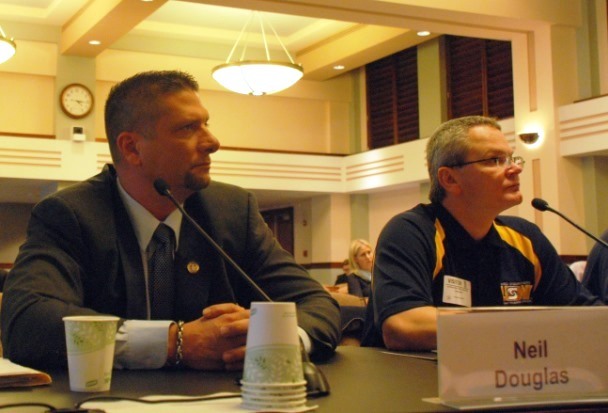 Douglas testified before officials from the U.S. Trade Representative’s Office and the Departments of Commerce, State, Treasury, Labor and Homeland Security. IAM Local 1943 in Middletown, OH represents nearly 2,000 members at AK Steel, Pilot Chemical, Bowling Transportation and Cummins Bridgeway. Douglas was joined by U.S. Rep. Tim Ryan (D-OH), whose father was a steelworker for 40 years. “Our workers can’t be on the agenda, they must be the agenda,” added Ryan.